Hello there stampers! This week at Dynamic Duos we are taking things "Soft and Subtle" with a combo of Certainly Celery and So Saffron. Although Certainly Celery is not my favorite shade of green, I REALLY like this pairing. Here is another attempt at "shabby". Does it qualify? I'm not sure. I sponged pretty much every edge of the card (and the white doily) with some Crumb Cake ink. There is a "chevron-theme" going on this card, too. After I lined up the little chevron pieces I thought about running some stitching down the middle and then I remembered....I don't sew. So, I opted for a line of pearls instead of the stitching. Finally, I added a punched and layered sentiment and a little punched butterfly just because it felt like it needed something else. Lots of items from the *new* Spring Catalog on this one. All of the products I used are listed at the end of the post. Before I go, I wanted to share some exciting news! 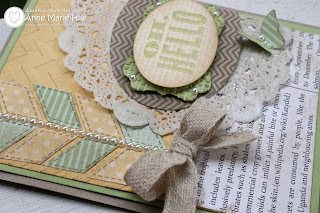 Stampin' Anne is (FINALLY) on Facebook! I hope you will stop by and "Like" my new page. Please, please! It's a great way to stay connected and share some more crafty goodness. Check it out by clicking HERE or clicking the photo below. Oh hello! Your card is A+ gorgeous. Anne-Marie this is a gorgeous take on the colour combo.Love all the textures you have used and its a great design. It is GORGEOUSLY shabby! I love every inch of it! I didn't get that "oh hello" stamp, just because I wasn't quite sure how it would roll, LOL! But I am rethinking it....you've made it work so well here! Love the chevrony things too! All-over wonderful! Shabby chic perfect! There is not one thing I don't like about this card. Every element goes perfect with the next. I'm amazed at your work! Beautifully soft and gentle...I want that ribbon..and those stamps.. Wonderful shabby chic design, Anne! Love the chevrons and beautiful details! Just gorgeous!!! I love everything! I really LOVE this card, Anne Marie!! I'm a huge fan of book-paper, and the way you pulled so many elements together is just lovely! Anne Marie - I LOVE this. This is beautiful! 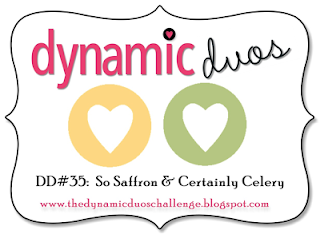 These are 2 of my favorite Stampin'Up colors. I love the doily, news print and overall design. You did an amazing job with the colors and the whole card is shabbilicious! You have the perfect mix of elements and the sentiment is great-I rather enjoy your randomness!! But my favorite part is the sewing, um...no...make that pearls! I always love when two people use the same set/colors and the cards are so different. I thought I loved mine...then I saw yours. You are one of my stamping Idols! Hugs. Great job with the shabby! That is one style I just can't do. Beautifully done. Oh... my... goodness! This is beyond fabulous Anne Marie! 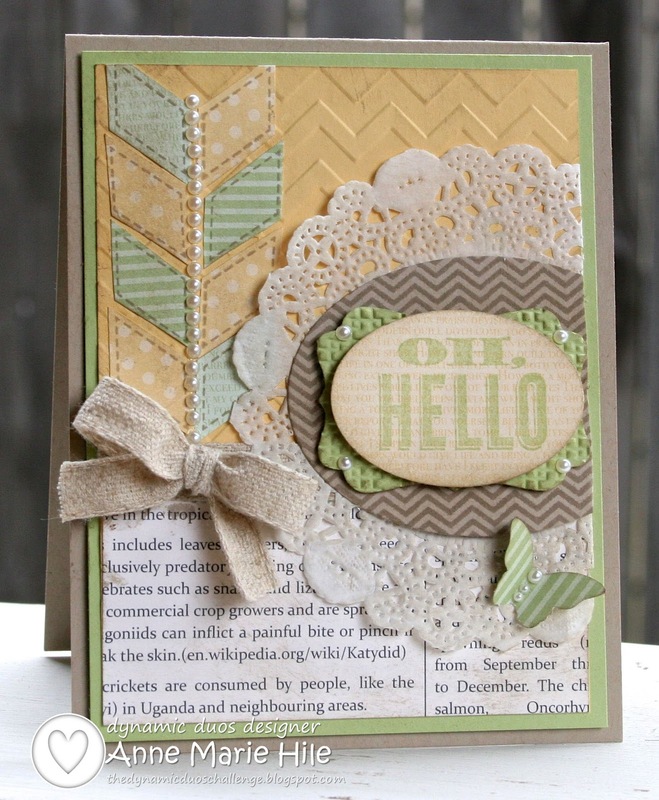 When I first saw your card my crafty heart did a little flip flop lol! The way you've used that stamp set togethe with the doily, the newsprint, pearls (three of my favourite things!) and that new ribbon just works so beautifully. Definitely one to case!! Your blog is always filled with pretty things thzt inspire me but I have to tell you that this is one of the prettiest cards that I have ever seen. I love the details from the strip of pearls to the butterfly and everything in between! Your card designs are so inspirational. This card in particular is gorgeous. Wonderful! Love this! Love that sentiment and how you incorporated pearls and chevrons! So very beautiful!